The Centre for Instructional Technology continues its tradition of service excellence. 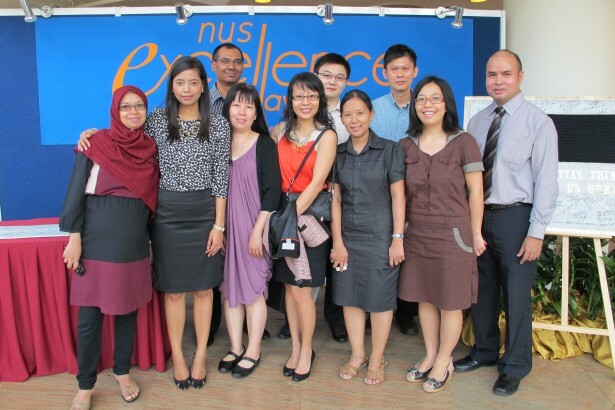 At NUS Excellence Day 2012, five CIT staff received individual awards. NEO Say Wei, Jum'main MOHD WAHID and Nik Azizi BIN MAT ZIN received the Service Achiever award. LEONG Miew Cheng and WU Haixin received the Service Advocate award. The IVLE IQ Team - Jeffery TAY, LEONG Miew Cheng, WU Haixin, Yasmin MUSTHAFA, XIANG Junjie and LIN Kay Thwe Oo - received a Merit Award for the IVLE eLearning Mobile Developer Challenge 2011 project. Posted in Awards and tagged quality on 22 February 2012 by Kenneth PINTO. Four CIT staff have demonstrated quality service in 2010, and they have been duly recognized at qAwards on Tuesday 18 January 2011. 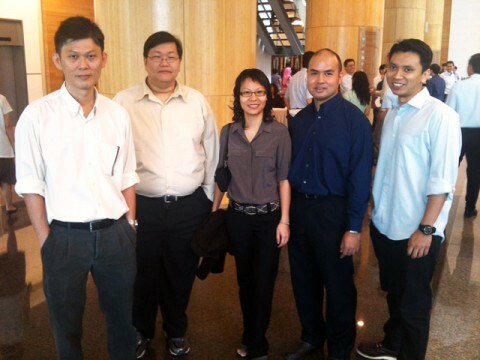 Nik Azizi BIN MAT ZIN and LEOW Sin Lak obtained the Service Achiever award. They have each received at least three customer compliments in 2010. Jum'main MOHD WAHID and NEO Say Wei received the Service Advocate award. They have each received at least two customer compliments in 2010. All four staff also met other qualifying criteria for the respective awards. Congratulations Nik, Sin Lak, Jum'main and Neo! Posted in Awards and tagged quality on 18 January 2011 by Kenneth PINTO. Siti HAJAR and Nik Azizi BIN MAT ZIN have received the Service Advocate Award 2009, part of the the NUS Quality Service Awards. Congratulations to Siti and Nik! Posted in Awards and tagged quality on 25 March 2010 by Kenneth PINTO. The Centre for Instructional Technology was conferred the Recognition for Service Excellence, under the auspices of the NUS Service Class, for its overall efforts and achievements in service quality. YONG Chee Ann received the NUS Quality Service Award in recognition of his efforts in providing quality customer service. Posted in Awards and tagged quality on 31 December 2009 by Kenneth PINTO. CIT has repeated its achievement of two major awards at this year's NUS Quality Service Day. Yong Chee Ann received the NUS Quality Service Award, recognising his efforts in providing quality customer service. Besides individual achievements, the Centre for Instructional Technology was also lauded as a whole. The department obtained the Recognition for Service Excellence in the NUS Service Class for its overall efforts and achievements in service quality. Additionally, the Remote Webcast Team was publically presented with the NIQC Gold Award for the Remote Webcast IQ project. This award was conferred last year during the NUS National Innovation and Quality Circles Convention. Posted in What's New and tagged quality on 16 January 2009 by Kenneth PINTO.